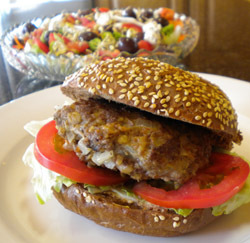 Here are some healthy and tasty burger recipes that I am sure your whole family will love. If your children are like mine and love to help in the kitchen, they will really enjoy helping you make these tasty burger recipes. It is always a tremendous challenge to find a healthy meal that children will love. My children were brought up on healthy food, but for some reason just when I think I’ve figured out what they love, it changes…so they really keep me guessing. However, there is one thing that I know that they will always enjoy, and that is our homemade burgers! We prefer to make my own because that way we know what is going into them and I think it is great that we can make this family favourite into a healthy meal that is relatively quick and easy to prepare. Beef burgers are one of my husband, Warren’s favourite foods, so he created this tasty recipe much to my children’s delight. 1. Put all the ingredients together in a mixing bowl and stir until combined. 2. Shape into 6 burgers. 3. Pour the olive oil into a non-stick pan and then arrange the burgers carefully in the pan. 4. Put a lid on the pan and cook over a gentle heat, turning once until almost cooked. 5. Take the lid off the pan and allow the juices to cook away and the burgers to brown slightly. 6. Serve them on a whole-wheat roll with tomato and lettuce – or whatever you prefer. You could oven bake these burgers at 180ºC (350ºF) for about 35 minutes or until done. Steam frying the burgers with a lid on the pan is a much healthier way of cooking, as it uses less oil and a gentler heat. You could choose to try them in a pan without a lid if you prefer. These very simple, quick and easy to make burgers contain tomato paste which gives them a wonderful flavour and adds some extra vitamins and minerals too. You could also use this recipe to make meat balls which are great baked in the oven. 6. Alternatively, bake the burgers in a moderate oven (180ºC or 350ºF) for about 35 minutes or until golden brown and cooked through. If you have some tasty burger recipes or any other recipes using ground beef you would like to share on this website, please click on this care to share? link to submit your recipe. I am always so thrilled to receive new and exciting healthy recipes.